BACKGROUND: For a review of basic quantum mechanics and statistical mechanics, read relevant chapters from an introductory Chemistry text book. Scientists in the late 19th century thought that it might be possible to exploit the magnetic record retained in accidental records to study the geomagnetic field in the past. Work in the mid 20th century provided the theoretical and experimental basis for presuming that such materials might retain a record of past geomagnetic fields. There are several books and articles that describe the subject in detail (see e.g., the supplemental readings). We present here a brief overview of theories on how rocks get and stay magnetized. We will begin with magnetism at the atomic level caused by electronic orbits and spins giving rise to induced magnetizations. Then we will see how electronic spins working in concert give rise to permanently magnetized substances (like magnetic minerals) making remanent magnetization possible. We learned in Chapter 1 that magnetic fields are generated by electric currents. Given that there are no wires leading into or out of permanent magnets, you may well ask, “Where are the currents?” At the atomic level, the electric currents come from the motions of the electrons. From here quantum mechanics quickly gets esoteric, but some rudimentary understanding is helpful. In this chapter we will cover the bare minimum necessary to grasp the essentials of rock magnetism. In Chapter 1 we took the classical (pre-quantum mechanics) approach and suggested that the orbit of an electron about the nucleus could be considered a tiny electric current with a correspondingly tiny magnetic moment. But quantum physics tells us that this “planetary” view of the atom cannot be true. An electron zipping around a nucleus would generate radio waves, losing energy and eventually would crash into the nucleus. 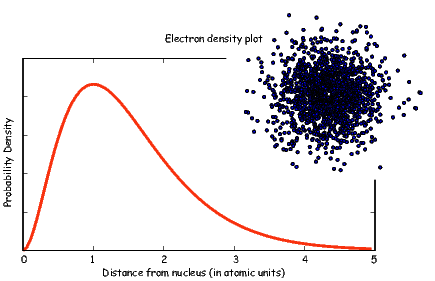 Figure 3.1: Plot of radial distribution and “dot-density” for the 1s electron shell. Apparently, this does not happen, so the classical approach is fatally flawed and we must turn to quantum mechanics. The number n is the so-called “principal” quantum number. The Rnl(r) are functions specific to the element in question and the energy state of the electron n. It is evaluated at an effective radius r in atomic units. The Y lm are a fully normalized complex representation of the spherical harmonics introduced in Section 2.2. For each level n, the number l ranges from 0 to n-1 and m from l backwards to -l.
where Z is the atomic number and ρ is 2Zr∕n. Note that at this energy level, there is no dependence of Y on ϕ or θ. Substituting these two equations into Equation 3.1 gives the probability density Ψ for an electron as a function of radius of r. This is sketched as the line in Figure 3.1. Another representation of the same idea is shown in the inset, whereby the density of dots at a given radius reflects the probability distribution shown by the solid curve. The highest dot density is found at a radius of about one atomic unit, tapering off the farther away from the center of the atom. Because there is no dependence on θ or ϕ the probability distribution is a spherical shell. All the l,m = 0 shells are spherical and are often referred to as the 1s, 2s, 3s shells, where the numbers are the energy levels n. A surface with equal probability is a sphere and example of one such shell is shown in Figure 3.2a. Shells with l = 1 depend not only on radial distance but also on the angles ϕ and θ, so they are not spheres, but more complicated shapes. A surface of equal probability for one such shell (the m = 1 shell) is shown in Figure 3.2b. Shells with l = 1 are called the “p” shells. As might be expected, the shells for l = 2 are even more complicated that for l = 1. These shells are called “d” shells and two examples are shown in Figure 3.2c and d.
Figure 3.2: Examples of surfaces of equal probability of the first three shells (l = 1,2,3). Surfaces created with Orbital Viewer. This is known as the Bohr magneton. Figure 3.3: Electronic structure of elements from Na to Zn. So far we have not mentioned one last quantum number, s. This is the “spin” of the electron and has a value of �1 2. The spin itself produces a magnetic moment which is given by 2smb, hence is numerically identical to that produced by the orbit. No two electrons may have the same set of quantum numbers. This is Pauli’s exclusion principle. Because spin (s) can be �1 2, two electrons fit in one orbital. When a single electron occupies a given orbital, it is called “unpaired” and has a magnetic moment of 1 mb. Orbitals are filled in order of increasing energy. The energy state of a given orbital is dependent on the context (whether the atom is bound to other atoms or not), but in general they will be filled according to the scheme shown in Figure 3.3. Electrons are added so that the spins remain as parallel as possible (Hund’s rule). 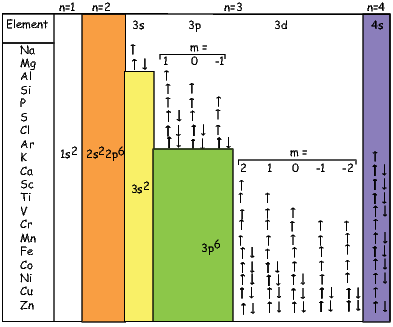 Notice in Figure 3.3 that when filling the third energy level (n = 3), all five d shells are filled with one kind of spin (say, all up, or +1 2), before the electrons begin to pair up. Also, because the energies of the shells change somewhat according to the context they are in, the 4s shell will actually give up an electron to a d shell, before the d shells begin to pair up. Hund’s rule gives the atoms with some d shell electrons (the so-called “transition elements”, e.g., Cr, Mn, Fe, Co and Ni) the possibility of large magnetic moments. Each unpaired spin has a moment of one Bohr magneton mb. The elements with the most unpaired spins are the transition elements which are responsible for most of the paramagnetic behavior observed in rocks. For example, in Figure 3.3 we see that Mn has a structure of: (1s22s22p63s23p6)3d54s2, hence has five unpaired spins and a net moment of 5 mb. Fe has a structure of (1s22s22p63s23p6)3d64s2 with a net moment of 4 mb, In minerals, the transition elements are in a variety of oxidation states. Fe commonly occurs as Fe2+ and Fe3+. When losing electrons to form ions, transition metals lose the 4s electrons first, so we have for example, Fe3+ with a structure of (1s22s22p63s23p6)3d5, or 5 mb. Similarly Fe2+ has 4 mb and Ti4+ has no unpaired spins. Iron is the main magnetic species in geological materials, but Mn2+ (5 mb) and Cr3+ (3 mb) occur in trace amounts. We have learned that there are two sources of magnetic moments in electronic motions: the orbits and the (unpaired) spins. These moments respond to external magnetic fields giving rise to an induced magnetization, a phenomenon alluded to briefly in Chapter 1. We will consider first the contribution of the electronic orbits. Figure 3.4: Larmor precession. The orbit of the electron has an angular momentum vector L which creates a magnetic moment. In the presence of a magnetic field H, the moment experiences a torque which causes a change in angular momentum ΔL. The precession of the electronic orbit about H creates an induced magnetic moment Δm in a sense opposite to the applied field H.
The angular momentum of electrons is quantized in magnitude but also has direction (see L in Figure 3.4). The angular momentum vector has an associated magnetic moment vector mb. A magnetic field H exerts a torque on the moment, which nudges it (and the momentum vector associated with it) to the side (ΔL). L therefore will precess around the magnetic field direction, much like a spinning top precesses around the direction of gravity. The precession of L is called Larmor precession. We learned in Chapter 1 that the proportionality between induced magnetization and the applied field is known as the magnetic susceptibility. 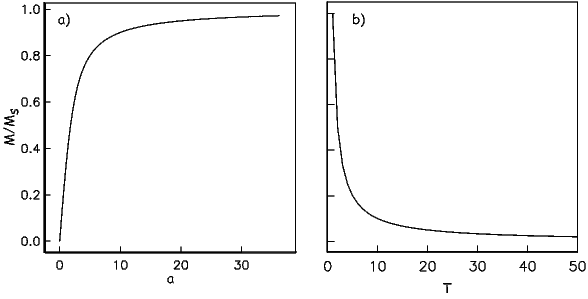 The ratio MI∕H for the response of the electronic orbitals is termed the diamagnetic susceptibility χd; it is negative, essentially temperature independent and quite small. This diamagnetic response is a property of all matter, but for substances whose atoms possess atomic magnetic moments, diamagnetism is swamped by effects of magnetic fields on the atomic magnetic moments. In the absence of unpaired electronic spins, diamagnetic susceptibility dominates the magnetic response. Common diamagnetic substances include quartz (SiO2), calcite (CaCO3) and water (H2O). The mass normalized susceptibility of quartz is -0.62 x 10-9 m3kg-1 to give you an idea of the magnitudes of these things. Figure 3.5: a) Paramagnetic magnetization (obtained from the Langevin function (a) versus a = mB∕kT.) 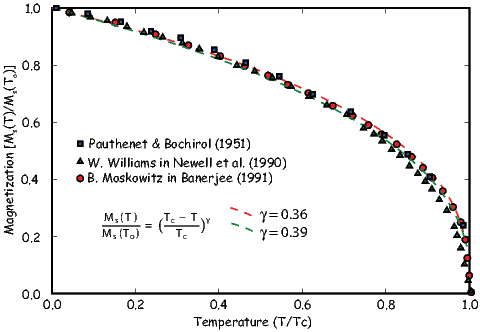 b) Paramagnetic magnetization as a function of temperature (Curie Law). In many geological materials, the orbital contributions cancel out because they are randomly oriented with respect to one another and the magnetization arises from the electronic spins. We mentioned that unpaired electronic spins behave as magnetic dipoles with a moment of one Bohr magneton. In the absence of an applied field, or in the absence of the ordering influence of neighboring spins which are known as exchange interactions, the electronic spins are essentially randomly oriented. An applied field acts to align the spins which creates a net magnetization equal to χpH where χp is the paramagnetic susceptibility. For any geologically relevant conditions, the induced magnetization is linearly dependent on the applied field. In paramagnetic solids, atomic magnetic moments react independently to applied magnetic fields and to thermal energy. At any temperature above absolute zero, thermal energy vibrates the crystal lattice, causing atomic magnetic moments to oscillate rapidly in random in orientations. In the absence of an applied magnetic field, atomic moments are equally distributed in all directions with a resultant magnetization of zero. Each unpaired spin contributes a dipole moment. In the absence of an applied field, the moments are essentially randomly oriented, i.e., all directions are equally likely to occur. Magnetic energy is at a minimum when the magnetic moment is lined up with the magnetic field. There is competition between the magnetic energy Em and the thermal energy kT where k is Boltzmann’s constant (1.38 x 10-23 m2 kg s-2 K-1) and T is temperature in kelvin). Consider an atomic magnetic moment, (m = 2mb = 1.85×10-23 Am2), in a magnetic field of 10-2 T, (for reference, the largest geomagnetic field at the surface is about 65 μT – see Chapter 2). The aligning energy is therefore mB = 1.85 × 10-25 J). However, thermal energy at 300K (traditionally chosen as a temperature close to room temperature providing easy arithmetic) is Boltzmann’s constant times the temperature, or about 4 x 10-21 J. So thermal energy is several orders of magnitude larger than the aligning energy and the net magnetization is small even in this rather large (compared to the Earth’s field) magnetizing field. where a = mB∕kT. The function enclosed in square brackets is known as the Langevin function ( ). To first order, paramagnetic susceptibility χp is positive, larger than diamagnetism and inversely proportional to temperature. This inverse T dependence (see Figure 3.5b) is known as Curie’s law of paramagnetism. The paramagnetic susceptibility of, for example, biotite is 790 x 10-9 m3 kg-1, or about three orders of magnitude larger than quartz (and of the opposite sign!). We have considered the simplest case here in which χ can be treated as a scalar and is referred to as the bulk magnetic susceptibility χb. In detail, magnetic susceptibility can be quite complicated. The relationship between induced magnetization and applied field can be affected by crystal shape, lattice structure, dislocation density, state of stress, etc., which give rise to possible anisotropy of the susceptibility. Furthermore, there are only a finite number of electronic moments within a given volume. When these are fully aligned, the magnetization reaches saturation. Thus, magnetic susceptibility is both anisotropic and non-linear with applied field. Some substances give rise to a magnetic field in the absence of an applied field. This magnetization is called remanent or spontaneous magnetization, also loosely known as ferromagnetism (sensu lato). Magnetic remanence is caused by strong interactions between neighboring spins that occur in certain crystals. The so-called exchange energy is minimized when the spins are aligned parallel or anti-parallel depending on the details of the crystal structure. Exchange energy is a consequence of the Pauli exclusion principle (no two electrons can have the same set of quantum numbers). In the transition elements, the 3d orbital is particularly susceptible to exchange interactions because of its shape and the prevalence of unpaired spins, so remanence is characteristic of certain crystals containing transition elements with unfilled 3d orbitals. As temperature increases, crystals expand and exchange becomes weaker. Above a temperature characteristic of each crystal type (known as the Curie temperature Tc), cooperative spin behavior disappears entirely and the material becomes paramagnetic. Equation 3.9 is known as the Curie-Weiss law and governs ferromagnetic susceptibility above the Curie temperature (dashed line in Figure 3.7). Figure 3.8: Various data sets for the behavior of Ms(T) for magnetite. where Tc is the Curie temperature and is given by: Equation 3.10 can be solved graphically or numerically and is sketched (solid line) in Figure 3.7. Below the Curie temperature, exchange interactions are strong relative to the external field and the magnetization is governed by Equation 3.10. Above the Curie temperature, it follows the Curie-Weiss law (Equation 3.9). 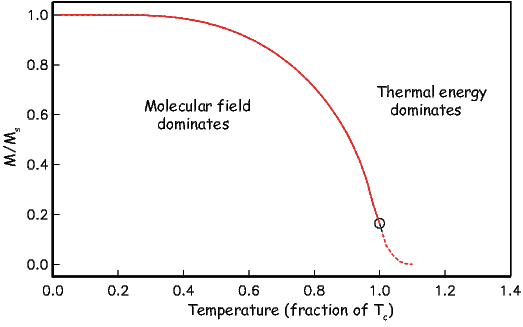 where γ is 0.5 from simple molecular field theory and To is absolute zero (in kelvin). Dunlop and �zdemir (1997) cite a value of around 0.43 for γ, but the data sets cited by Dunlop and �zdemir (1997; e.g., Figure 3.5 on page 52) are actually best-fit with values for γ of about 0.36 – 0.39 (see Figure 3.8). These curves have been normalized by their inferred curie Temperatures which are around 565∘C (data of B. Moskowitz, cited in Banerjee, 1991). Figure 3.9: Types of spin alignment in ferromagnetism (sensu lato): a) ferromagnetism (sensu stricto), b) antiferromagnetism, c) spin-canted antiferromagnetism, d) defect anti-ferromagnetism, e) ferrimagnetism. As we have seen, below the Curie temperature, certain crystals have a permanent (remanent) magnetization resulting from the alignment of unpaired electronic spins over a large area within the crystal. Spins may be either parallel or anti-parallel; the sense of spin alignment is controlled entirely by crystal structure. The energy term associated with this phenomenon is the exchange energy. There are three categories of spin alignment: ferromagnetism (sensu stricto), ferrimagnetism and antiferromagnetism (see Figure 3.9). Figure 3.10: a) Response of a magnetic moment to the torque of an applied field for isolated moments. b) Response of coupled moments to a perturbation. Neighboring spins produce an effect known as “spin waves”. In ferromagnetism (sensu stricto, Figure 3.9a), the exchange energy is minimized when all the spins are parallel, as occurs in pure iron. When spins are perfectly antiparallel (antiferromagnetism, Figure 3.9b), there is no net magnetic moment, as occurs in ilmenite. Occasionally, the antiferromagnetic spins are not perfectly aligned in an antiparallel orientation, but are canted by a few degrees. This spin-canting (Figure 3.9c) gives rise to a weak net moment, as occurs in hematite, a common magnetic mineral (see Chapter 6). Also, antiferromagnetic materials can have a net moment if spins are not perfectly compensated owing to defects in the crystal structure, as occurs in fine-grained hematite. The uncompensated spins result in a so-called defect moment (Figure 3.9d). We note in passing that the temperature at which spins become disordered in antiferromagnetic substances is termed the N�el temperature. In ferrimagnetism, spins are also aligned antiparallel, but the magnitudes of the moments in each direction are unequal, resulting in a net moment (Figure 3.9e). In figures like Figure 3.9, electronic spins are depicted as being simply aligned with some minimum energy direction (aligned with the field, or along some easy axis). Yet we already know about the paramagnetic effect of misalignment through random thermal fluctuations. 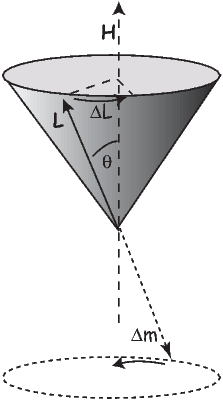 We learned that an external magnetic field generates a torque on the electronic spins, and in isolation, a magnetic moment will respond to the torque in a manner similar in some respects to the way a spinning top responds to gravity: the magnetic moment will precess about the applied field direction, spiraling in and come to a rest parallel to it (Figure 3.10a). Because of the strong exchange coupling in ferromagnetic phases, spins tend to be aligned parallel (or antiparallel) to one another and the spiralling is done in a coordinated fashion, with neighboring spins as parallel as possible to one another (Figure 3.10b). This phenomenon is known as a spin wave. SUPPLEMENTAL READINGS: O’Reilly (1984), Chapter 3.1; Dunlop and �zdemir (1997), Chapter 2.1 to 2.7.
a) Given one Bohr magneton (mb) in the Earth’s field (40 μT), write a program using Python that calcuates magnetostatic interaction energy (-mbB cosθ) for angles 0→ 180∘. Make a plot of this with the matplotlib module in Python. b) Calculate the thermal energy at room temperature (300K). How does this compare with the interaction energy? Fayalite (Fe2SiO4) is a paramagnetic solid with magnetic susceptibility χ = 4.4 x 10-4 (cgs units) at 0∘C (= 273K). A single crystal of fayalite has a volume of 2 cm3. This crystal is placed in a magnetic field, H = 10 oe at 0∘C. What is the resulting induced magnetic moment m of this crystal? a) Do this problem first in cgs units. Then convert your answer to SI using the conversion factors in Table 1.1 in Chapter 1.
b) Do the problem again by first converting all the parameters into SI units. Check your answer by converting the SI answer that you get back to cgs. You should get the same answer (but you would be surprised how many people do this wrong). If fayalite is placed in a magnetic field H= 100 oe at a temperature of 500∘C (= 773K), what is the resulting magnetization, M? MnS is a paramagnetic solid. At 300K there are 4 x 1028 molecules of MnS per m3. Look up the number of unpaired spins for the cationic magnetic moment of Mn2+ in the text and find the paramagnetic susceptibility, χ, of MnS at 300K? a) Read into a Pandas DataFrame the datafile Chapter_3/BMoskinBan91.txt provided. Make a plot of magnetization versus temperature. What is the Curie temperature of the material? b) Using this Equation 3.11 from the chapter, find the value for γ between 0.35 and 0.43 at intervals of 0.01 that fits the best. Plot the data as in Figure 3.8 in the chapter, i.e. Ms(T)∕Ms(To) against T∕Tc.